Make your own Hermann Interactive Souvenir with our hand-finished and branded wood plaques and your choice of Playmobil Action Figures. We have the Traditional Alpine Family with Dachshund and Platter of Sausages, Soccer Player who can kick the ball into the net, Pirate with a Cannon that really shoots, Boy with Go-Kart, Wedding Couple, St. Louis Blues Hockey Player or Goalie, and many more. This can be the perfect gift for your out-of-town friends, or for your own desk! The plaque is just $8 and the action figures range from $3.99 and up. The new Playmobil toys for 2018 are very exciting. The Arctic Expedition and Aquarium are available now, with more new sets coming out later this year. 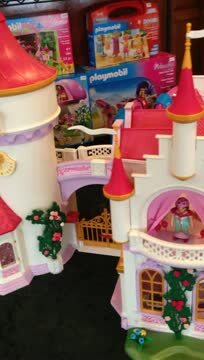 This fabulous Princess Castle with 9 rooms has found a new home with 2 wonderful little girls, but new Princess items are always coming in! Pirates and Airports have arrived at Blondie's Dolls! Come in to see all the sets and add-on items for hours of fun for the whole family! Visit Playmobil Land on Schiller! At Blondie's Dolls, we have built a special Playmobil Land where children and parents can experience the joy of Playmobil toys. Specially chosen Playmobil sets are available for children to have hands-on playtime with two Dollhouses, the Horse Paddock set, the Adventure Treehouse and Jeep and Canoe, the Petting Zoo and Zookeeper's Cart, and the School bus for all children in Playmobil land to take to school. Blondie's Dolls has Playmobil Police Cars, Firetrucks, Ambulances, Dump Trucks, Trash Trucks, Police Motorcycles, Helicopters, and even a City car or Convertible for cruising around town! An assortment of Playmobil boy and girl figures to collect and mix. Each package is a mystery of which of the 12 figures it will contain and are interchangeable with other figures. Playmobile Deluxe Dollhouse and six rooms of furniture. For sale and on display at Blondie's Dolls. The house includes a doorbell that buzzes, the Living room set includes a fireplace that 'flickers', and the Bedroom set includes lights that glow.